Three educators who understand the potential educational opportunities that arise when Monarchs, schoolyard gardens and students are put together: Dr. Charles Watson, Jennifer Clements and Principal Chris Grey. 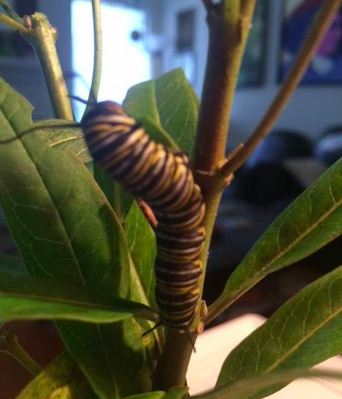 Perhaps its true that what we think about we see more of, as lately I’ve been getting a heavy dose of seemingly serendipitous connections to Monarchs and Monarch-loving people. For example, just last Saturday (December 12, 2015) Beth Dattomo, Mayor Athas’ brilliant assistant, stopped over in the afternoon to review the possibility of submitting a proposal for grant money for a schoolyard garden. It so happens the proposal must be submitted to the University of Minnesota Monarch Lab by 11:59 PM tonight (Tuesday Dec. 15). Then, shortly after Beth left on Saturday, Charlie, who was fossil hunting near Gainesville, Texas called me to excitedly report that he saw a Monarch butterfly. Imagine that! 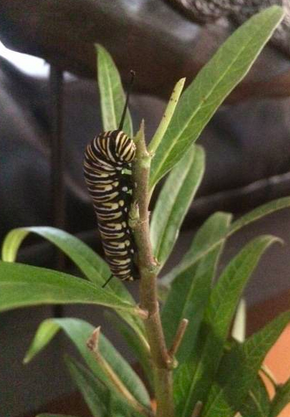 December 12 in North Texas and Monarch is sighted. I have written the proposal for the schoolyard Monarch Garden at Watson. At the moment it is being reviewed by Jennifer Clements, a teacher at Watson Technology Center here in Garland, Texas who will be the team leader for this project. Jennifer is also collecting the necessary signatures and will send them to me this evening. Fortunately the proposal can be submitted electronically tonight to the University of Minnesota Monarch Lab. 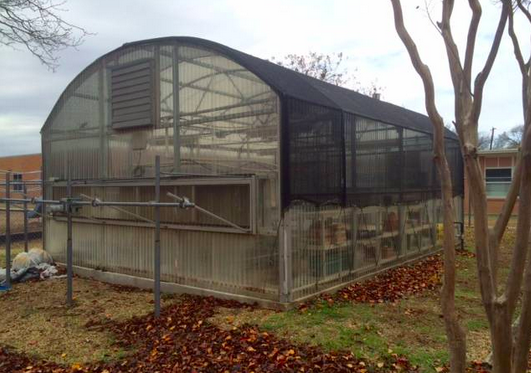 Greenhouse at Watson Technology Center, Garland, Texas—Getting ready for a whole lot of Milkweed and a great Monarch Habitat--in fact, two of them! At 11 AM today I drove over to Watson Technology Center to deliver the draft of the proposal to Jennifer. It just so happened that the principal of the school was chatting in the hall with Dr. Charles “Matt” Watson who is a Professor of Biology at Midwestern State University. Dr. Watson’s son attends Watson. Dr. Watson is helping one of his doctoral students in setting up an experiment with growing milkweed in part of the garden area of the school near where their lovely greenhouse is located. At the moment I don’t know the details of this study but I hope to learn more regarding what they are measuring. Dr. Charles M. Watson is an integrative evolutionary biologist with interest and training in physiology, biogeography, biodiversity, conservation, and evolutionary ecology. His current projects integrate field ecology, physiological laboratory trials, and GIS technology to answer broad-scale evolutionary and ecological questions. Principal Grey is a leader who obviously can not only collaborate effectively with people from various walks of life and absorb new ideas quickly, he is also a person who does not lose sight of his responsibility to look out for students. I was very impressed that he could chat with us and still be able to see a small girl running down the hall and gently stop her and caution for her safety to not run in the hall. And Monarch Mania continues with a Monarch Webinar featuring our Mayor Athas as one of the speakers. From 3 to 4 PM this afternoon, I attended an informative webinar on the topic of Monarchs that was hosted by Patrick Fitzgerald, Senior Director of Community Wildlife, National Wildlife Federation. Our Mayor Athas was one of the featured speakers along with Lajuan Tucker from Austin Texas and Catherine Werner from St. Louis. Mayor Athas pointed out that the state of Texas is solidly behind Monarch and pollinator awareness. He is right and you can expect a lot of good programs to be coming out of the Texas Parks and Wildlife Foundation to support the Monarch—our state insect. Many statewide organizations are joining hands to assist in bringing back the Monarch population. Schoolyard gardens are a natural classroom for students of all ages—from 5 to 105. The garden offers infinite possibilities for learning. A garden is like a river. It is constantly changing. Heraclitus once said that one could never step into the same river twice—a profound statement that is nonetheless true for a garden. Formats for lessons in the garden are not limited to botany, science and agriculture. The garden can teach lessons in all phases of human endeavor—from ethics to ecology, from math to art. Gardens have an important role to play in the education of our children and I'm glad that my community recognizes their importance to our children. Loving Garland Green is a member-directed 501 C 3 nonprofit organization with the mission to encourage residents of Garland Texas to grow some of the food they eat. From November through the first of February we have our annual Pecan Mania fundraiser. Proceeds from the sales of our pecans help fund our various community programs--including our stewardship of the Garland Community Garden. 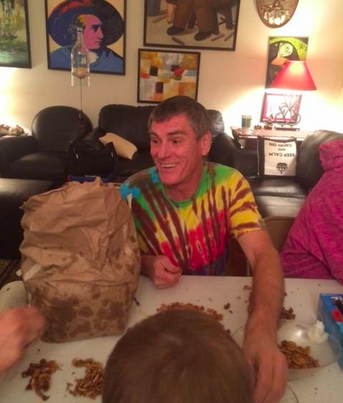 December 7, 2015 - Burgi Bartlett is thus far the leader for pecan sales for an individual member. To date I believe Burgi has sold 20 bags. We obtain our pecans by harvesting them from public property and also by harvesting them on the half (sharing 50/50 with people who have pecan trees on their property). Harvesting the pecans from the trees is just part of the process--which probably explains why pecans are so expensive in the stores--it is a very labor-intensive process. After they are harvested, they must then be blown to remove dust and then cracked. Instead of cracking them by hand, we have this part done by a vendor. Then we pick them out of the shells, and put them in one-pound bags and weigh them for sale. Members of Loving Garland Green all have their individual and sometimes strong opinions about things and that includes pecan prices. This year we have encountered some challenges in setting a firm per pound price. Thus, how much you donate for a pound of pecans will depend in part upon the particular member who is selling them to you. The only thing I can guarantee is that no one-pound bag of Loving Garland Green pecans will sell for less than $8 this year. The current market value in the stores seems to be between $8 and $10 per one-pound bag. However just before Thanksgiving I did see some pecans for sale at $6.88 for a one-pound bag. However, if you looked at these pecans, you would see they are dark--one of the signs of age in pecans. Other pecans in the same store in a different location were priced at $7.88 a pound and these pecans were lighter. What I suspect is that a lot of vendors were left holding their bags of pecans last year because the price skyrocketed to $13.99 a pound. Thus many folks decided they could live without pecans for the holiday season of 2014. Now these pecans have likely been repackaged for resale in 2015. 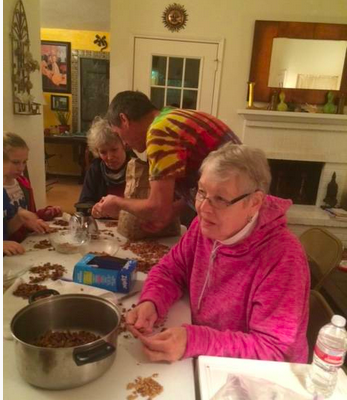 All the pecans being sold by Loving Garland Green were picked in November and December of 2015. 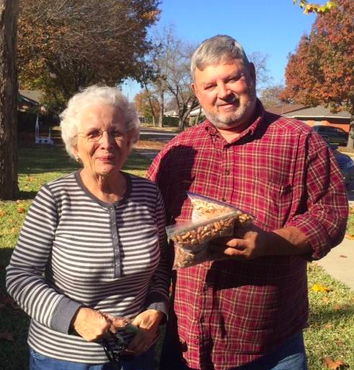 Some of our members are selling one-pound bags of pecans for $8. Other members are selling one-pound bags for $10. Still other members are making deals such as if you buy two bags of pecans, you can have them for $8 a bag. If you only purchase one bag, then it's $10. I apologize if this causes confusion, but perhaps it's best to remember that your purchase is a donation to a charitable organization that supports the local community of Garland, Texas. Over the past two years as President of Loving Garland Green I've learned to not attempt to herd cats because if you do, you'll be sure to get scratched. I love cats and I also have learned to respect them. December 8, 2015 - Charlie Bevilacqua, board member of Loving Garland Green delivers two one-pound bags to Johnnie Pierce. Johnnie requested pieces because she will be using the pecans to make holiday candy. December 8, 2015 - Getting fatter by the day. On December 5 this caterpillar was rescued from the Garland Community Garden where he was found desperately trying to extract nourishment from a withered dry leaf. Last night at our meeting, Anita Opel, Treasurer for LGG, volunteered to take it with her to South Texas where she is going for Christmas. 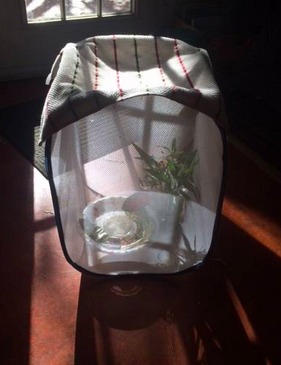 We are hoping it will be a pupa--at least until Anita arrives in South Texas. Once a month members of Loving Garland Green gather in force to work in the Garland Community Garden. 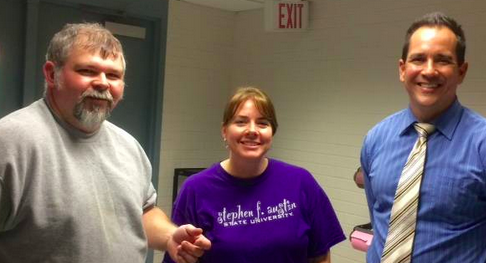 Yesterday we combined our monthly workday with our pecan sale drive for a fun and successful day. 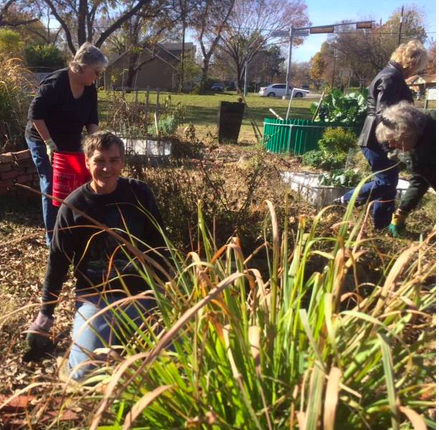 Even though the garden is winding down for the winter, it is still producing and that is the word we would like to get out to Garland residents. Just Friday we were were able to deliver twenty one-gallon bags to the Good Samaritans of Garland. 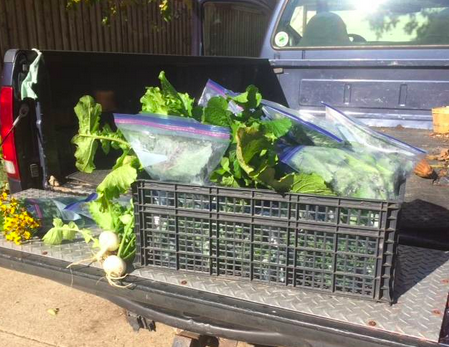 Currently, over November and December alone we have delivered 98 one-gallon bags of greens. 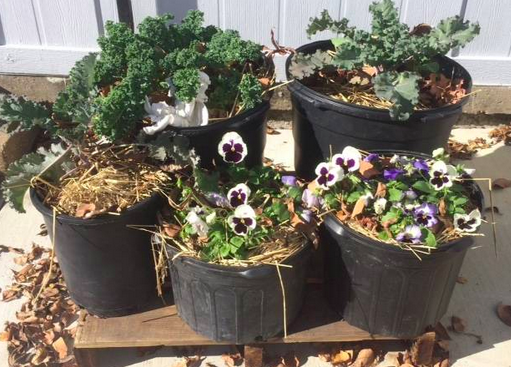 In Garland, even in the winter you can grow edibles--most notably are winter greens such as kale, mustard and turnip greens. In addition, broccoli and Brussels sprouts also thrive in our area. Growing your own greens can save you and your family up to a $1,000 a year. Furthermore, you don't need a large lot for growing them. You can garden in containers from a patio or deck. In addition to pulling out stalks of finished plants such as okra and tomatoes, we converted one of our large beds to a hugelkulter. To do this we dug out a center trench in the log bed, installed rotting logs, and then recovered with the already rich garden soil from the bed. Normally we don't disturb the soil of our beds with digging, but we made an exception in this instance and consider this remedial work. We plan to do the same in many of the beds over the winter. One of the best things that a gardener can to to help conserve water is to engineer beds so that damp rotting logs are at the bottom of the bed with organic matter and then garden soil on top of that. Depending on the size of the rotting logs, they will furnish water and other nutrients to plants growing in the bed for several years with little or no water. While we were cleaning out one of the flower beds, a Loving Garland Green member discovered a healthy-looking Monarch Caterpillar. It appeared to be trying to obtain nourishment from a dead leaf. December 5 and a Monarch caterpillar? There are no healthy milkweed left in the Garland Community Garden. I took the caterpillar home where I have milkweed growing inside--waiting for a home somewhere in a greenhouse for the winter. I'm calling it "The Christmas Monarch" because it should eclose 3 to 4 days after the 25th of December. The caterpillar has a Monarch Condo all to itself. He is now busy doing the healthy caterpillar thing: eating and defecating. December 6, 2015 - Garland Texas --Monarch Condo with Four Pupas in the sun. As for the other four monarch pupas, they are reaching the outer limits of time allotted for being a monarch pupa. I will admit that I'm a little concerned but I haven't given up hope. Saturday, December 5 marked their 14th day. Some references say this time can last up to 21 days. They have all moved from their lovely green color to the dark stage which indicates they are just about ready to eclose. 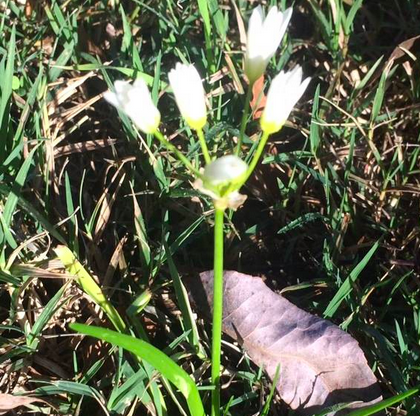 Winter Wildflower – December 4, 2015 – Garland Community Garden--In the garden you’ll always find hope for a better day. As usual, when I’m upset about events on the national scene over which I have little or no control, I turn to the garden for solace. Nature never lets me down. This morning even in the approaching deadness of winter it is beautiful and still yielding food. I collected twenty one-gallon bags of greens, turnips, rosemary and tarragon and delivered to the Good Samaritans of Garland Texas. It did my heart good to see the Hugelkultur container garden we delivered a few weeks ago thriving. It was also nice to meet yet another kind volunteer there at the Good Samaritans—Bill Matthews (“Mr. Bill”). He has been volunteering twice a week at the Good Samaritans of Garland since 2007. 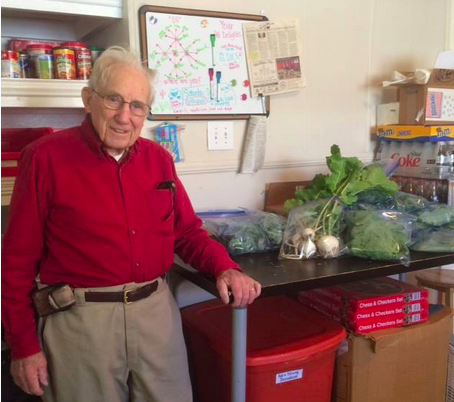 It's volunteers like Bill who help to build a strong and healthy community. December 4, 2015 - Garland Good Samaritan Center - "Mr. Bill", one of the many dedicated volunteers at the Garland Good Samaritan Center.